Are you looking for a Pre-Engineered Portable Submersible System designed to handle the most severe dewatering applications? Engineered to be portable the submersible de-watering system is equipped with four point lifting eyes and integrated fork slots for easy mobility by crane or fork-truck.The pump and check valve are enclosed within a removable FRP grating (fiberglass) with slots no larger than 1.25 inch to prevent any large trash, fish, ropes, or other objects from clogging the pump. The control panel is housed in a 304 SST NEMA 4X enclosure with an H-O-A selector switch, mechanical floats, run light, alarm horn, key pad, and an elapsed time meter on an enclosed door. 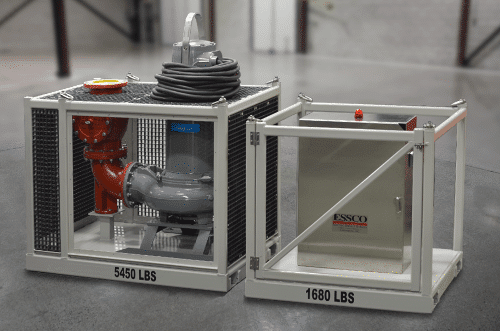 Plug & Play – Simply lower the skid into place, connect hoses and electrical connections, and the system is operational.